This Congregation for Divine Worship and the Discipline of the Sacraments has received \ our letter dated 9 December 2002, related to the application of the norms approved by the Conference of Bishops of the United States of America, with the subsequent recognitio of this Congregation, as regards the question of the posture for receiving Holy Communion. To this end, it is perhaps useful to respond to your inquiry by repeating the content of a letter that the Congregation recently addressed to a Bishop in the United States of America from whose Diocese a number of pertinent letters had been received. The letter states: "... while this Congregation gave the recognitio to the norm desired by the Bishops' Conference of your country that people stand for Holy Communion, this was done on the condition that communicants who choose to kneel are not to be denied Holy Communion on these grounds. Indeed, the faithful should not be imposed upon nor accused of disobedience and of acting illicitly when they kneel to receive Holy Communion". There are groups, of no small influence, who are trying to talk us out of kneeling. "It doesn't suit our culture", they say (which culture?) "It's not right for a grown man to do this — he should face God on his feet". Or again: "It's not appropriate for redeemed man — he has been set free by Christ and doesn't need to kneel any more". Aristotle called it a barbaric form of behavior (cf. Rhetoric 1361 a36). Saint Augustine agreed with him in a certain respect: the false gods were only the masks of demons, who subjected men to the worship of money and to self-seeking, thus making them "servile" and superstitious. He said that the humility of Christ and His love, which went as far as the Cross, have freed us from these powers. We now kneel before that humility. The kneeling of Christians is not a form of inculturation into existing customs. It is quite the opposite, an expression of Christian culture, which transforms the existing culture through a new and deeper knowledge and experience of God. On closer inspection, we can discern three closely related forms of posture. First there is prostratio — lying with one's face to the ground before the overwhelming power of God; secondly, especially in the New Testament, there is falling to one's knees before another; and thirdly, there is kneeling. Linguistically, the three forms of posture are not always clearly distinguished. They can be combined or merged with one another. For the sake of brevity, I should like to mention, in the case of prostratio, just one text from the Old Testament and another from the New. In the Old Testament, there is an appearance of God to Joshua before the taking of Jericho, an appearance that the sacred author quite deliberately presents as a parallel to God's revelation of Himself to Moses in the burning bush. Joshua sees "the commander of the army of the Lord" and, having recognized who He is, throws himself to the ground. At that moment he hears the words once spoken to Moses: "Put off your shoes from your feet; for the place where you stand is holy" (Josh 5:15). In the mysterious form of the "commander of the army of the Lord", the hidden God Himself speaks to Joshua, and Joshua throws himself down before Him. Origen gives a beautiful interpretation of this text: "Is there any other commander of the powers of the Lord than our Lord Jesus Christ?" According to this view, Joshua is worshipping the One who is to come — the coming of Christ. In the case of the New Testament, from the Fathers onward, Jesus' prayer on the Mount of Olives was especially important. According to Saint Matthew (22:39) and Saint Mark (14:35), Jesus throws Himself to the ground; indeed, He falls to the earth (according to Matthew). However, Saint Luke, who in his whole work (both the Gospel and the Acts of the Apostles) is in a special way the theologian of kneeling prayer, tells us that Jesus prayed on His knees. This prayer, the prayer by which Jesus enters into His Passion, is an example for us, both as a gesture and in its context. The gesture: Jesus assumes, as it were, the fall of man, lets himself fall into man's fallenness, prays to the Father out of the lowest depths of human dereliction and anguish. He lays His will in the will of the Father's: "Not my will but yours be done". He lays the human will in the divine. He takes up all the hesitation of the human will and endures it. It is this very conforming of the human will to the divine that is the heart of redemption. For the fall of man depends on the contradiction of wills, on the opposition of the human will to the divine, which the tempter leads man to think is the condition of his freedom. Only one's own autonomous will, subject to no other will, is freedom. "Not my will, but yours . . ." — those are the words of truth, for God's will is not in opposition to our own, but the ground and condition of its possibility. Only when our will rests in the will of God does it become truly will and truly free. The suffering and struggle of Gethsemane is the struggle for this redemptive truth, for this uniting of what is divided, for the uniting that is communion with God. Now we understand why the Son's loving way of addressing the Father, "Abba", is found in this place (cf. Mk 14:36). Saint Paul sees in this cry the prayer that the Holy Spirit places on our lips (cf. Rom 8:15; Gal 4:6) and thus anchors our Spirit-filled prayer in the Lord's prayer in Gethsemane. In the Church's Liturgy today, prostration appears on two occasions: on Good Friday and at ordinations. On Good Friday, the day of the Lord's crucifixion, it is the fitting expression of our sense of shock at the fact that we by our sins share in the responsibility for the death of Christ. We throw ourselves down and participate in His shock, in His descent into the depths of anguish. We throw ourselves down and so acknowledge where we are and who we are: fallen creatures whom only He can set on their feet. We throw ourselves down, as Jesus did, before the mystery of God's power present to us, knowing that the Cross is the true burning bush, the place of the flame of God's love, which burns but does not destroy. At ordinations prostration comes from the awareness of our absolute incapacity, by our own powers, to take on the priestly mission of Jesus Christ, to speak with His "I". While the ordinands are lying on the ground, the whole congregation sings the Litany of the Saints. I shall never forget lying on the ground at the time of my own priestly and episcopal ordination. When I was ordained bishop, my intense feeling of inadequacy, incapacity, in the face of the greatness of the task was even stronger than at my priestly ordination. The fact that the praying Church was calling upon all the saints, that the prayer of the Church really was enveloping and embracing me, was a wonderful consolation. In my incapacity, which had to be expressed in the bodily posture of prostration, this prayer, this presence of all the saints, of the living and the dead, was a wonderful strength — it was the only thing that could, as it were, lift me up. Only the presence of the saints with me made possible the path that lay before me. Secondly, we must mention the gesture of falling to one's knees before another, which is described four times in the Gospels (cf. Mk 1:40; 10:17; Mt 17:14; 27:29) by means of the word gonypetein. Let us single out Mark 1:40. A leper comes to Jesus and begs Him for help. He falls to his knees before Him and says: "If you will, you can make me clean". It is hard to assess the significance of the gesture. What we have here is surely not a proper act of adoration, but rater a supplication expressed fervently in bodily form, while showing a trust in a power beyond the merely human. The situation is different, though, with the classical word for adoration on one's knees — proskynein. I shall give two examples in order to clarify the question that faces the translator. First there is the account of how, after the multiplication of the loaves, Jesus stays with the Father on the mountain, while the disciples struggle in vain on the lake with the wind and the waves. Jesus comes to them across the water. Peter hurries toward Him and is saved from sinking by the Lord. Then Jesus climbs into the boat, and the wind lets up. The text continues: "And the ship's crew came and said, falling at His feet, 'Thou are indeed the Son of God'" (Mt 14:33, Knox version). Other translations say: "[The disciples] in the boat worshiped [Jesus], saying . . ." (RSV). Both translations are correct. Each emphasizes one aspect of what is going on. The Knox version brings out the bodily expression, while the RSV shows what is happening interiorly. It is perfectly clear from the structure of the narrative that the gesture of acknowledging Jesus as the Son of God is an act of worship. We encounter a similar set of problems in Saint John's Gospel when we read the account of the healing of the man born blind. This narrative, which is structured in a truly "theo-dramatic" way, ends with a dialogue between Jesus and the man He has healed. It serves as a model for the dialogue of conversion, for the whole narrative must also be seen as a profound exposition of the existential and theological significance of Baptism. 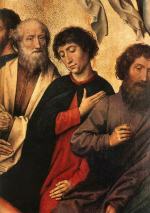 In the dialogue, Jesus asks the man whether he believes in the Son of Man. The man born blind replies: "Tell me who He is, Lord". When Jesus says, "It is He who is speaking to you", the man makes a confession of faith: "I do believe, Lord", and then he "[falls] down to worship Him" (Jn 9:35-38, Knox version, adapted). Earlier translations said: "He worshiped Him". In fact, the whole scene is directed toward the act of faith and the worship of Jesus, which follows from it. Now the eyes of the heart, as well as of the body, are opened. The man has in truth begun to see. For the exegesis of the text it is important to note that the word proskynein occurs eleven times in Saint John's Gospel, of which nine occurrences are found in Jesus' conversation with the Samaritan woman by Jacob's well (Jn 4:19-24). This conversation is entirely devoted to the theme of worship, and it is indisputable that here, as elsewhere in Saint John's Gospel, the word always has the meaning of "worship". Incidentally, this conversation, too, ends — like that of the healing of the man born blind — with Jesus' revealing Himself: "I who speak to you am He" (Jn 4:26). I have lingered over these texts, because they bring to light something important. In the two passages that we looked at most closely, the spiritual and bodily meanings of proskynein are really inseparable. The bodily gesture itself is the bearer of the spiritual meaning, which is precisely that of worship. Without the worship, the bodily gesture would be meaningless, which the spiritual act must of its very nature, because of the psychosomatic unity of man, express itself in the bodily gesture. The two aspects are united in the one word, because in a very profound way they belong together. When kneeling becomes merely external, a merely physical act, it becomes meaningless. On the other hand, when someone tries to take worship back into the purely spiritual realm and refuses to give it embodied form, the act of worship evaporates, for what is purely spiritual is inappropriate to the nature of man. Worship is one of those fundamental acts that affect the whole man. That is why bending the knee before the presence of the living God is something we cannot abandon. In saying this, we come to the typical gesture of kneeling on one or both knees. In the Hebrew of the Old Testament, the verb barak, "to kneel", is cognate with the word berek, "knee". The Hebrews regarded the knees as a symbol of strength, to bend the knee is, therefore, to bend our strength before the living God, an acknowledgment of the fact that all that we are we receive from Him. In important passages of the Old Testament, this gesture appears as an expression of worship. At the dedication of the Temple, Solomon kneels "in the presence of all the assembly of Israel" (II Chron 6:13). After the Exile, in the afflictions of the returned Israel, which is still without a Temple, Ezra repeats this gesture at the time of the evening sacrifice: "I . . . fell upon my knees and spread out my hands to the Lord my God" (Ezra 9:5). The great psalm of the Passion, Psalm 22 ("My God, my God, why have you forsaken me? "), ends with the promise: "Yes, to Him shall all the proud of the earth fall down; before Him all who go down to the dust shall throw themselves down" (v. 29, RSV adapted). The related passage Isaiah 45:23 we shall have to consider in the context of the New Testament. The Acts of the Apostles tells us how Saint Peter (9:40), Saint Paul (20:36), and the whole Christian community (21:5) pray on their knees. Particularly important for our question is the account of the martyrdom of Saint Stephen. The first man to witness to Christ with his blood is described in his suffering as a perfect image of Christ, whose Passion is repeated in the martyrdom of the witness, even in small details. One of these is that Stephen, on his knees, takes up the petition of the crucified Christ: "Lord, do not hold this sin against them" (7:60). We should remember that Luke, unlike Matthew and Mark, speaks of the Lord kneeling in Gethsemane, which shows that Luke wants the kneeling of the first martyr to be seen as his entry into the prayer of Jesus. Kneeling is not only a Christian gesture, but a christological one. For me, the most important passages for the theology of kneeling will always be the great hymn of Christ in Philippians 2:6-11. In this pre-Pauline hymn, we hear and see the prayer of the apostolic Church and can discern within it her confession of faith in Christ. However, we also hear the voice of the Apostle, who enters into this prayer and hands it on to us, and, ultimately, we perceive here both the profound inner unity of the Old and New Testaments and the cosmic breadth of Christian faith. The hymn presents Christ as the antitype of the First Adam. While the latter high-handedly grasped at likeness to God, Christ does not count equality with God, which is His by nature, "a thing to be grasped", but humbles Himself unto death, even death on the Cross. It is precisely this humility, which comes from love, that is the truly divine reality and procures for Him the "name which is above every other name, that at the name of Jesus every knee should bow, in heaven and on earth and under the earth" (Phil 2:5-10). Here the hymn of the apostolic Church takes up the words of promise in Isaiah 45:23: "By myself I have sworn, from my mouth has gone forth in righteousness a word that shall not return: 'To me every knee shall bow, every tongue shall swear'". In the interweaving of Old and New Testaments, it becomes clear that, even as crucified, Jesus bears that "name above every name" — the name of the Most High — and is Himself God by nature. Through Him, through the Crucified, the bold promise of the Old Testament is now fulfilled: all bend the knee before Jesus, the One who descended, and bow to Him precisely as the one true God above all gods. The Cross has become the world-embracing sign of God's presence, and all that we have previously heard about the historic and cosmic Christ should now, in this passage, come back into our minds. The Christian Liturgy is a cosmic Liturgy precisely because it bends the knee before the crucified and exalted Lord. Here is the center of authentic culture — the culture of truth. The humble gesture by which we fall at the feet of the Lord inserts us into the true path of life of the cosmos. There is much more that we might add. For example, there is the touching story told by Eusebius in his history of the Church as a tradition going back to Hegesippus in the second century. Apparently, Saint James, the "brother of the Lord", the first bishop of Jerusalem and "head" of the Jewish Christian Church, had a kind of callous on his knees, because he was always on his knees worshipping God and begging forgiveness for his people (2, 23, 6). Again, there is a story that comes from the sayings of the Desert Fathers, according to which the devil was compelled by God to show himself to a certain Abba Apollo. He looked black and ugly, with frighteningly thin limbs, but most strikingly, he had no knees. The inability to kneel is seen as the very essence of the diabolical. But I do not want to go into more detail. I should like to make just one more remark. The expression used by Saint Luke to describe the kneeling of Christians (theis ta gonata) is unknown in classical Greek. We are dealing here with a specifically Christian word. With that remark, our reflections turn full circle to where they began. It may well be that kneeling is alien to modern culture — insofar as it is a culture, for this culture has turned away from the faith and no longer knows the one before whom kneeling is the right, indeed the intrinsically necessary gesture. The man who learns to believe learns also to kneel, and a faith or a liturgy no longer familiar with kneeling would be sick at the core. Where it has been lost, kneeling must be rediscovered, so that, in our prayer, we remain in fellowship with the apostles and martyrs, in fellowship with the whole cosmos, indeed in union with Jesus Christ Himself. © 2002 Adoremus: Society for the Renewal of the Sacred Liturgy.